Bring in a painting, finished or not. A professional artist will be giving suggestions to improve your piece. Whether it be color, design, subject or technique, there is always something to be learned from the "Critique" meeting. Critiquing is meant to enhance your work, give new ideas and boost your own creativity. It's always a fun time. Bring a friend! Don't forget SPRING SHOW 2019! 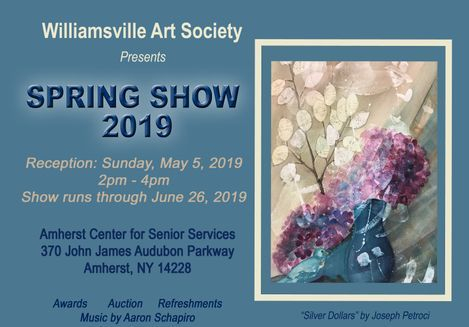 Beautiful artwork is displayed at the Amherst Center for Senior Services for two months. The reception is a bustling event with wonderful food provided by Asbury Pointe. The auction enables everyone to leave with a "Surprise." Bring the family to this fun event. Prizes are awarded for outstanding artwork. A slideshow captures the winning pieces for immediate viewing.